Alexei with his very apt students. ONE OF MY fondest times in Moscow was Tuesdays spent with Alexei. He was the teacher who taught us lacquer box painting. For two hours every Tuesday, the five of us who lived within the same building would converge at Julia’s home for the class, bringing our little ones along and some snacks for after-class tea time. Our first lesson was on 3 April 2007 at the fee of Rb1,000 (RM140) per lesson. Our initial investment was Rb460 (RM65) for a set of Tempera paints, two brushes, sandpaper and chalk, and a blank box. Boxes of various shapes and sizes were later purchased at the price of between Rb100-250 (RM14-RM35). By the time the class ended after seven sessions, we had enough boxes (and confidence) to display our crafts in an in-house exhibition. In total I completed 12 boxes, gave one away, and have several blank ones still sitting in the storeroom waiting to be painted, along with my Tempera paints which are probably all dried up today. My first box complete with my name in Russian. My second box was presented to a friend who collects boxes when she visited Moscow in 2007; hubby eventually spotted that box on display in Universiti Malaya, along with her large collection of boxes collected throughout her diplomatic career (5 April 2011). “Minnie loves Mickey” specially painted for my daughter M.
Two boxes, each featuring a firebird and a dragon, mythical creatures in the Russian and Chinese folklores respectively. Part of my collection of self-painted lacquer boxes. (L) VIP visitors to our in-house exhibition where members of our association displayed their crafts; (R) Tun Jean Abdullah (wife of then-Prime Minister) and Datin Seri Sharifah Aziah Syed Zainal Abidin (wife of then-Foreign Minister) taking a keen interest in the lacquer boxes while Datin Sri Dr. Kalsom Ismail (wife of then-Science, Technology and Innovation Minister) looks on (19 June 2007). 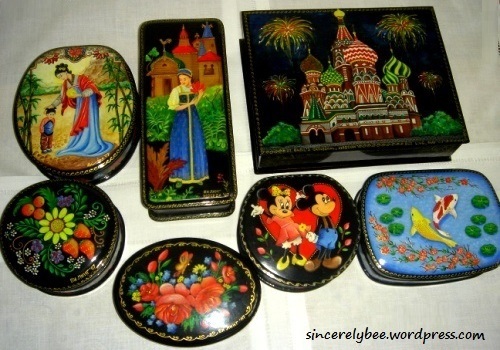 This entry was posted in Forever Friends, Memories of Moscow and tagged Crafts, Friends, Lacquer Boxes, Moscow, Russia. Bookmark the permalink. ← A Bundle of Joy!